Talking on a phone is a skill that has to be taught and learned. ParentShield examines some of the issues involved in introducing Mobile Phones to Children. At ParentShield we talk every day to parents considering getting their children their very first mobile phone. It's a scary prospect for most. But with the right approach and the right mindset and the right mobile phone we say it's an outstanding learning opportunity and an outstanding safety device. The ability to safely contact home at any time provides important confidence and peace of mind for everyone and allows children to venture further into the world independently than they may otherwise do. What age to give a child their first mobile phone? Circumstances are always different, but ParentShield exists to allow parents to safely provide a mobile phone to a child at a far younger age than they might if only regular mobile phone networks were available. Regularly we speak to parents at exhibitions and events who declare, with varying degrees of horror it must be said, that they'd NEVER! give a mobile phone to a young child. So we thought we'd put this page together to discuss some of the reasons we hear. You never know who a child will speak to or give their number to! This is an understandable concern for all the obvious reasons. With ParentShield as the network, this is not the case as every call and every text message is available to the parent or guardian for review. It's easy at a glance to see who has contact with your child's phone, and easy to understand how and why these contacts came about. It's natural with a normal phone to want to discourage your child from sharing their telephone number. You'd want as few people as possible to be using that number because the dangers would be hidden. But at ParentShield we send a sheet of "my phone number is" stickers with each SIM card. We hope that as many parents as possible understand that with the conversations and communications open and understood they can actually encourage their child to talk and listen over a mobile phone. Communication in the absence of visual clues, without the ability to pull faces and see faces pulled, and without the ability to rely on gestures is a skill that must be learned. We believe that learning these skills early gives a child a vital head start. As employers, we are all too familiar with young recruits freezing in terror when their desk phone rings in front of them for the first time, or they're asked to call another department to arrange a meeting. Learning early makes all the difference and good verbal-only communication relies on developing listening skills, talking skills and clear enunciation, and a broad vocabulary. Speaking to people we're not that familiar with isn't necessarily dangerous and it does help develop those skills. The child will run up a massive phone bill! Oh boy, this happens. We all know someone, if it's not ourselves, who has inadvertently run up a surprise bill by calling a premium rate number or using unexpected amounts of data without knowing it. It's an awful feeling. You budget x amount for your mobile bill, and then when it arrives you find it's double, treble or eek. Worse. To make matters worse, children have no sense of financial responsibility and even less understanding of the difference between two mobile numbers. Adults are rarely aware that calling a mobile beginning 07624 will cost you more than calling one beginning 07978. They're just numbers, so how can you trust a child to not be far worse? ParentShield takes care of all this. our SIMS block all 'out of tariff' numbers, all overseas numbers, all directory enquiry short codes phone numbers and all text shortcaode numbers. Your regular mobile service will probably just present a warning voice message before connecting your child. And we know what will happen there. The ParentShield tariffs are all fixed so it's impossible to spend more that the 9.99, 14.99 or 19.99 per month that you select. If you want extra calls or extra data then it's a simple case of uploading funds onto the account beforehand. When that balance is spent, the extra data or calls will terminate. This gives the parent the freedom to provide a great life lesson in budgeting. Talk to your child about allowances and explain how many minutes they have per month. A bit of maths lesson allows them to work out their daily allowance. It's a great set of lessons and we love seeing our customers making the most of the opportunity. We are worried about security too. A mobile phone contains private text messages, private contact lists, possibly private photographs. It will also contain passwords and access tokens to online services. Increasingly mobile phones are being used as the second factor in 2-factor authentications. every mobile phone needs to be locked and the user needs to understand why. Mobile phones give us the ability to teach the importance of these things. 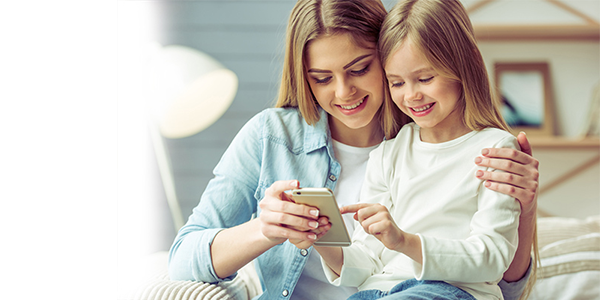 ParentShield is designed to operate from the network and not from the phone so it's possible to put a ParentShield SIM into a child's phone and encourage the child to make up and remember their own pass-code. We can teach the importance of a strong password and stress that nobody else should ever know it. Knowing your child's pass-code so you can access the phone actually teaches that other people can have access to their phone. It means that you don't teach the importance of regularly changing passwords - particularly if you think it may have been compromised. This hands-off-my-phone approach gives responsibility to the child. It's their personal device, not yours! if they forget their password then that's also a lesson. You can always reset a phone to factory settings. There's a lesson. they won't do that again. All content © Engine Mobile Ltd unless otherwise stated. ParentShield™ is a trade mark of Engine Mobile Ltd. All prices shown include VAT. "Give them the phone they want"